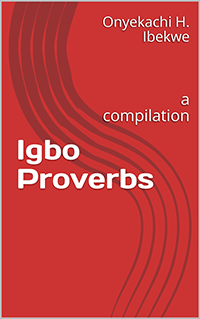 This is a compilation of 1,000 proverbs in Igbo language, each followed by a usable English translation. The author, Onyekachi H. Ibekwe made this compilation after much personal reflection on the remote origins and existential imports of the proverbial mode of communication. Proverbs remain vital and peculiar elements of Igbo traditional religion, daily discourse and contemporary worldview. Made available on the digital platform, it is the author’s hope that this compilation will serve as a portable, easily navigable reference for anybody that has an interest in the subject matter.